Former number one draft pick Markelle Fultz will start the Philadelphia 76ers' NBA opener against the Boston Celtics. Sixers head coach Brett Brown confirmed guard Fultz – selected first in the 2017 Draft – will be in the starting line-up on Tuesday, with veteran JJ Redick coming off the bench. 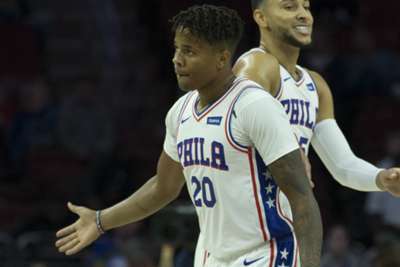 Fultz has endured a difficult start to his NBA career, the 20-year-old hampered by injuries and a hitch in his jump-shot through his rookie season. He averaged 7.1 points per game and attempted a single three-pointer in just 14 regular-season appearances in 2017-18 before falling out of Philadelphia's playoff rotation – totalling just 23 minutes in three postseason appearances. Discussing his decision on the eve of Philadelphia's season opener, Brown told reporters on Monday: "How do I grow Markelle and especially with Ben [Simmons and Joel [Embiid]? How do I win games and put us in a position to move us forward? And how do you deliver a team to the end of April and May and hopefully June that's better when it started? Rookie of the Year Ben Simmons was Philadelphia's primary guard throughout last season and asked about his relationship with the Australian star, Fultz said: "We play perfectly well together… It will be very exciting for people to watch." The 76ers made a splash in 2017-18, Brown's youthful Philadelphia roster reaching the Eastern Conference semi-finals after advancing to the playoffs for the first time since 2011-12. "We kind of came out of left-field last season, won 16 games in a row, beat Miami Heat 4-1… everyone looks at us differently. Our vision line has changed. In my eyes in some ways too.